I just go totally crazy about tasty foods that are healthy, or is it the healthy foods that are absolutely delicious?! Can't decide. 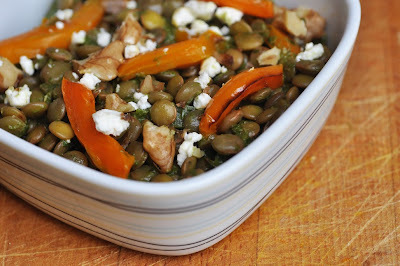 This Lentil Salad seems to becoming my new favorite lunch in record times. It includes all the healthy foods: legumes, raw green leafy vegetables, nuts, and rich in vitamin C roasted veggies. What's so tasty about it: I love the combination of the sweetish roasted bell peppers, combined with nutty lentils, some tart salsa verde and crunchy nuts on top. It's good and filling enough to take as lunch box as it can be prepared in advance and keeps well overnight. It also goes well as a low-carb side dish with some roasted meat at dinner or at a BBQ. Bon Appetit! Cook the lentils in two cups of slightly salted water until tender, about 20 minutes. Drain and set aside. Deseed and devein the bell peppers. Cut them into stripes. Toss in a few drops of olive oil until roughly coated and season with some salt. Place on a baking sheet, and roast in the oven until tender about 15 minutes. Turn them over halfway to provide even cooking. Set aside. To make the salsa verde, whizz all ingredients in a blender until smooth. Season with salt and pepper to taste. Add a few tablespoons of the salsa verde to the lentils and toss. Add roasted peppers and thinly sliced spring onions. Sprinkle over the feta and chopped walnuts. Ready to eat! !